�����The $5 Gold Indian series has all the inherent characteristics that collectors demand. It is collectible as a complete set, it is made of Gold, the coin is well above average visually, there are rarities with a few that are extremely rare in Mint State grades, and demand is relatively consistent. Of course, there are times, even though there is demand, it may be at lower levels. The last couple of years have seen a drop in value for many series. How has this drop influenced the $5 Indian market? The chart below shows the FMV for the complete set of business strike $5 Gold Indians for various Mint State grades from January 2010 compared to the current FMV, along with the percentage change. �����Keep in mind that the price of Gold in early January 2010 was $1121.50; currently Gold is at $1,274.50, up by only 13.5%. The most common date in the $5 Gold Indian series is the 1909D. In the MS60 grade the FMV for the 1909D was $528 in 2010 and today it is actually lower at $496. The main reason for this drop is the dwindling premiums for generic Classic Gold coins versus the Modern Eagles and other current Mint products. It seems that today�s collectors are all about getting more Gold for their money, regardless of rarity. �����It is the rare dates and better dates that have pushed the MS60 prices higher since 2010. The 1909 O is the rarest date in the series and has climbed from $29,060 FMV in 2010 to the current price of $36,880. There are only 27 coins certified in MS60 and a total of just 194 coins in higher Mint State grades; the highest being a single PCGS coin in MS66. The 1929 is the second rarest date and has jumped from $18,130 FMV in 2010 to the current $28,750. There are ten coins certified in MS60 by PCGS and NGC, with 472 coins in higher Mint State grades, with 16 coins total in the highest grade of MS65. These two dates account for over $18,000 of the increase for the entire set of MS60 coins, which means that the other 22 coins that make up the Mint State set only increased a total of $2,840. �����In the MS63 grade, the complete set has increased 6% during the selected timeframe. However, a closer look shows that the majority of the dates in MS63are lower; in fact, some are much lower in today�s market. The common 1909D was $2,280 FMV in 2010 and today it is only $900. But the population for the MS63 lists a total of 18,293 between PCGS and NGC, making it extremely easy to acquire and, evidently, at very reasonable levels. This also helps explain why the premiums have dropped for generic U.S. Gold. Many of the other semi-common dates in the MS63 grade have declined substantially, like the 1911 & 1912, currently at $1,170 FMV, down over $1,300 each. �����There are seven dates in the MS63 grade that have increased over this time period; the 1908 S, 1909 O, 1910 S, 1911 D, 1912 S, 1913 S and 1929. The FMV for these seven dates increased a total of $42,470, which means the other 17 dates actually dropped $23,930. The rare and better dates have been the better performers. Buyers have definitely changed their purchasing habits since 2014 when this series was at its last peak. 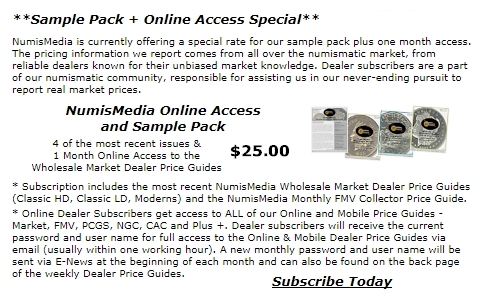 The more common issues have been continually offered at discounts on the dealer wholesale networks during this recent trend. �����The MS64 grade for the $5 Gold Indian series has performed a lot like the MS63 grade. Nine better date coins have increased in value and the rest have drifted considerably lower. While the complete set shows a modest increase of 4%, many of the more common dates have fallen as much as 50%. The 1910 in MS64 had an FMV of $5,530 in 2010 and now is listed at $2,810. Much like a number of other dates in the MS64 grade, the 1910 has a substantial population with 553 coins certified. Dealers are offering discounted bids for several of these dates and other dealers who have them in inventory are willing to sell at discounts to reduce inventory. This makes for great opportunities in the retail end of the market. �����Unlike the other listed complete sets of $5 Indians, the MS65 set is showing a rather dramatic decline, down nearly $100,000. But the majority of this decline is concentrated on nine dates which includes the 1908, 1909 P & D, and 1910 through 1915. These dates fell a combined $105,360; this means that all of the rest, the rare and better dates, had a cumulative increase of about $5,000. Most of the nine common dates have 50 or more coins certified in MS65 with the 1908 the highest at 344 and the 1909 D next with a population of 206 coins. �����Most of the rare dates in MS65 have ten or fewer certified with many around five. There are seven extremely rare dates in MS65 and higher grades with an FMV of $100,000 or more. Of these seven dates there are a total of 31 MS65 coins certified by PCGS and NGC combined with 16 of them being the 1929. There are only a total of five coins certified in higher grades for this group of seven. These seven dates should continue to be in strong demand in the future. �����The peak of this series was in 2014 when the sets were priced much higher. The complete set of $5 Gold Indians in MS63 was at $352,150, the MS64 was at $644,680, and MS65 was at $1,885,100. So where does this series go from here? As long as buyers are looking for lower premium Modern Gold coins, most of the common Classic U.S. Gold will tend toward the current sporadic lows. However, when the cycle reverses as we have seen many times in the past, demand should rise for many of these Mint State coins.